Shown above are our reproductions of the three uniforms General Thomas J. 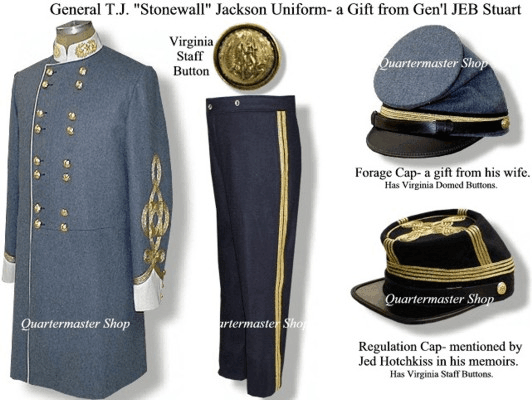 "Stonewall" Jackson is reported to have worn. They are arranged left to right in the chronological order he acquired them. By clicking on the individual coats above you will be taken to the detailed information for that particular uniform. All of our reproduction Jackson coats are copied from his original coats or period photographs of the General wearing that coat. All are made in fabrics that match his uniforms. Buttons supplied are closest match to what was on the original coat. All coats have black polished cotton lining with natural sleeve linings. All coats are unhemmed. Professor Jackson's VMI Frockcoat: This is the type of coat Thomas J. Jackson's wore while he was a Professor at VMI before the war. 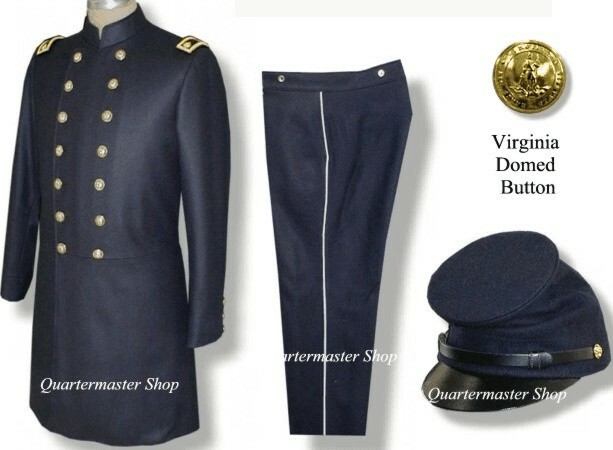 This is also the uniform he wore at First Manassas where he earned his nickname "Stonewall" from General Bernard Bee. Original coat is at the Jackson House Museum in Lexington, VA. At left is our reproduction. The coat is double breasted and made in our deluxe dark blue wool with black polished cotton lining. Sleeves have natural cotton lining. Split cuffs are functional and close with three small buttons. Virginia State Seal domed buttons. Shoulder Boards for rank of Staff Major included but not attached. Raw bottom edge per original coat. Made in USA! 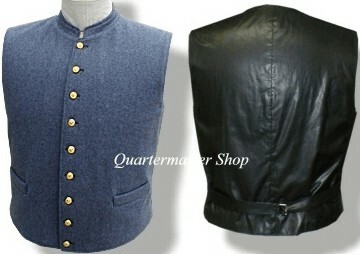 Professor Thomas J. Jackson's VMI Vest: Although not with the original uniform, this is the typical Vest Professor Jackson would have worn. Deluxe dark blue wool with black polished cotton back. 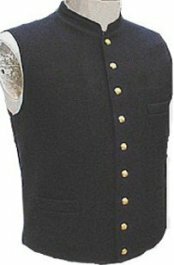 Nine small Virginia State seal buttons close the vest. Small belt in back for waist adjustment. Made in USA! Professor T. J. Jackson's VMI Trousers: The original trousers are in the collection of the Stonewall Jackson House Museum in Lexington, VA. Our reproduction trousers feature our deluxe dark blue wool with 1/8" Buff (off white) wool piping in outseam. Side seam pockets. Eleven Bone buttons for fly and suspenders supplied loose. Raw inseam of 35". Made in USA! 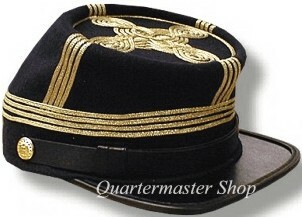 Professor TJ Jackson Forage Cap: While a professor at VMI, Jackson wore a typical cadet style forage cap. 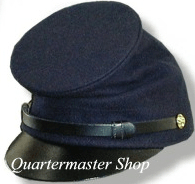 He was very fond of this cap and continued to wear it in the field during the War. Dark Blue wool with black polished cotton lining. Virginia State Seal buttons. Chin Strap is 1/2" width and without brass slide. Thomas J. Jackson's coat often referred to as "the plain grey frock...". 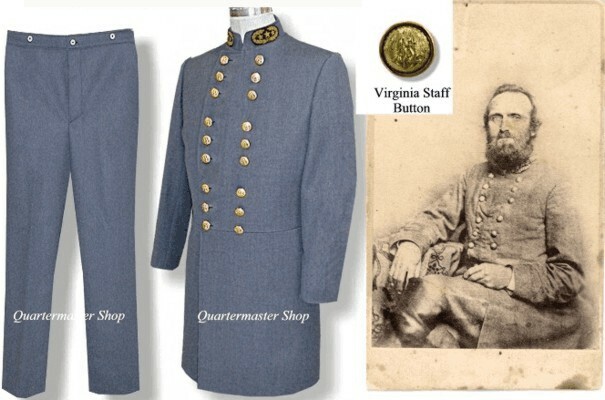 He wore either this Field Frock or his VMI coat during the many battles in the Shenandoah Valley before he became so famous at Chancellorsville. 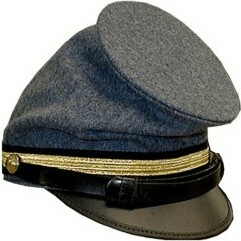 His wife, Anna, presented him with a new cap which he wore quite frequently with this uniform. Our reproduction coat is double breasted and made in our top quality Cadet Grey wool with Black polished cotton lining. Virginia State Seal Staff buttons are placed in the 3 x 3 arrangement. No trim colors, no sleeve braid. Three small buttons on the cuff for decoration. Black Extra Rich General's Badge on the collar. Rear skirt pockets with flaps. Raw bottom edge per original coat. Made in USA! Standing collar style Vest compliments the outfit. Matching wool with Black cotton back and adjusting belts. Two pockets at the waistline. Nine small Virginia Staff buttons. Natural cotton lining. Made in USA! Confederate Foot style trousers in matching wool without stripes or piping. Side seam pockets. No back pockets. Button fly. Eleven Bone buttons are supplied to accept our #1907 Suspenders. Raw inseam length is 35". 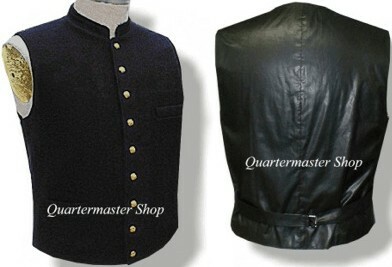 Our reproduction of Thomas J. Jackson's coat often referred to as the "gift from General JEB Stuart" is shown at left. He is wearing this uniform in the famous photo taken of him two weeks before his death. His map maker, Jed Hotchkiss, described this uniform as a "Regulation uniform with Regulation trousers and Cap". Dark blue trousers are evident in the larger photograph of him wearing this uniform. Regulation Kepi Cap. Our reproduction coat is double breasted and made in our Cadet Grey wool with black polished cotton lining. Virginia Staff buttons in 4 x 2 Regulation arrangement. Buff trim colors with four rows of gold sleeve braid. Three small buttons on the closed cuff for decoration. Extra Rich General's embroidery directly on Buff collar. Rear skirt pockets with buff colored flaps. Raw bottom edge per original coat. Made in USA! Standing collar style Vest compliments the outfit. Matching wool with Black Polished cotton back and adjusting belts. Two pockets at the waistline. Nine small Virginia Staff buttons. Natural cotton lining. Made in USA! Regulation Confederate General Foot style trousers in Deluxe Dark Blue wool with two stripes of 5/8" gold lace with a 1/4" window showing. Side seam pockets. No back pockets. Button fly. Eleven Bone buttons are supplied to accept our #1907 Suspenders. Raw inseam length is 35".